Tony’s favourite wah pedal is an old Tychobrahe Parapedal. It was made in the early seventies. They have not been available new for many years now although I believe there is someone who has now started making clones called the Parachute. Tychobrahe was a PA company that was founded in 1969 by Bob Bogdanovich, brother of the famous film director Peter Bogdanovich. They worked with Sabbath on some of their early tours of the US. Their chief engineer was Jim Gamble who designed their speaker cabinets, amplifiers and mixing consoles. He also designed the three guitar effects that were sold under the Tychobrahe name, the Octavia, the Paraflanger and the Parapedal. It was on these tours in the early seventies that Tony was introduced to the Parapedal and he has used it ever since. It has an unusual circuit with two frequency peaks being tracked by the pedal operation. It also has a dive bomb effect when the heel of the pedal is pressed down hard against the rubber stopper. They are very rare nowadays and we have a stable of three complete units and a couple of original circuit boards. Here is a picture of it on the studio effects board. It is on the right of the board. Thank You for all the AMAZING riffs over the years…Have tickets for show in Camden NJ in August and it will GREAT to see you wailing again! Teaching your songs to my guitar student and he loves them…Thank You Father of Heavy Metal! another pedal based on the dual-pot sweep design of the tychobrae…also hard to find anymore is the Hiwatt Custom Wah…it’s been my fave for years and sounds REALLY close to the tycho….so in a pinch anyone wanting to get the same type of wah sweep, you might try looking for the Hiwatt pedal…but good luck, since these are getting to be somewhat rare as well. Robert Bogdanovich, founder of Tycobrahe Sound Company, was not related to Peter Bogdanovich, the film director. They just happen to have the same last name. Today Robert “Bogie” Bogdanovich is the owner/operator of Casa Roland resort hotels in Costa Rica and Panama. 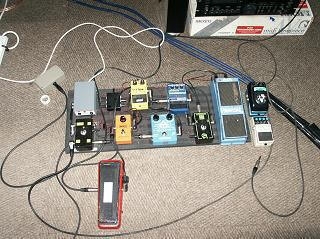 I did write the text about the Tycobrahe pedal, though it was a long time ago! I did state the relationship re the Bogdanovich name but it was made in good faith from sources I did explore at the time. Apologies. More soon about gear ! I did write the original artilcle discussed here, though it was a long time ago. Regarding the sibling status of Bob Bogdanovich, I cannot remember where I picked up this reference, but I would not have picked it out of thin air. I would have seen or been told it and referred to it in good faith in the website piece. I apologise if this is incorrect, and I hope no harm has come of my observation.